That Sugar Nellie have some brilliant Candy on offer as always. Well how could i pass up the chance??? And here is what i have come up with i do hope they like it but I've never won anything in my life, so I'm not going to hold my breathe on this one. I know i know, they only asked for a Header! So i ended up doing 1 Blog Header, 1 Matching Background, and 2 Little Logos to complete the set. I just hope people like it as much as i do. 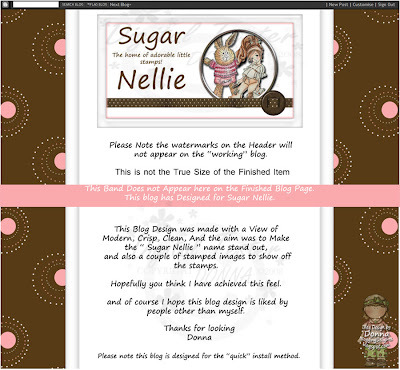 This entry was posted on 10.9.08 and is filed under Sugar Nellie Stamps (Sold at Funkykits) . You can follow any responses to this entry through the RSS 2.0 feed. You can leave a response, or trackback from your own site. I think that it is fantastic, I also love what you have done with your own blog - it is lush!